If you poll custom home builders in Calgary, chances are you’ll find that skylights are a feature clients ask about a lot. Natural light is an ideal source of supplementary illumination, helping reduce electricity consumption while brightening up the mood of any room or open space. However, there are some seasonal problems associated with traditional skylight designs. In winter, they can allow heat to escape; in summer, they can contribute to heat gain in your home. Fortunately, progressive custom home builders in Calgary have adopted new approaches which neutralize these issues. The heat loss and gain problems typically associated with skylights are largely the result of the materials used in their construction. Specifically, plastic was the standard material for many years, and its ineffective thermal transfer properties are exactly what gives rise to wintertime heat loss and summertime heat gain. Plastic is also not very durable, and it will discolour over time thanks to prolonged exposure to the elements. Upgrading to glass is a very worthwhile investment, as glass is far more durable and will never discolour. More importantly, glass has far superior thermal transfer properties, which have been improved in recent years with the introduction of specialized tints and glazes. These finishes can actually absorb heat without blocking light, virtually eliminating heat gain during the summer. Because glass is thicker and denser than plastic, winter heat loss rates are also significantly reduced. Specialized glass finishes can also improve impact resistance. Both tempered glass and laminated glass help skylights remain more durable, and prevent them from breaking up into dangerous shards should an impact ever occur. Even so, glass technologies are only part of the equation; the shape and placement of the skylight is also a vitally important consideration. To this end, a number of new approaches to design and placement are making major inroads with homeowners and custom home builders in Calgary. Skylights have traditionally been flat and rectangular in shape. However, these conventions are falling out of favour with custom home builders, and innovative designs are rising in their place. The tubular skylight is one of the most popular new designs. Tubular skylights are dome-shaped, which allow sunlight to strike the glass at varying angles. Incoming light is then redirected through a small tube, which has a diffusive and magnifying effect. In essence, tubular designs allow you to enjoy all the benefits of skylights in a much smaller package, which goes a long way towards preventing winter heat loss. Finally, you may also want to consider high-tech skylight features. Some of the most advanced characteristics include tracking technologies and specialized lenses which follow the sun across the sky throughout the day, capturing the greatest amount of incoming light. You can also get specialized coatings that automatically tint during the summer to prevent heat gain and revert to full transparency on cooler days. 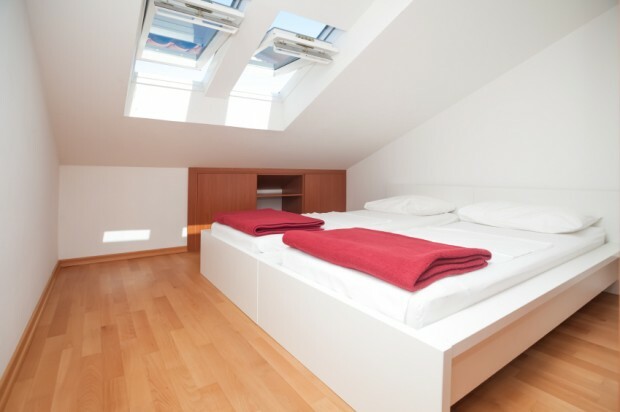 However, you should also keep the drawbacks of skylights in mind. They can impede proper roof ventilation and speed up the melting of snow on your roof, both of which can lead to serious problems like ice dams. You can minimize these risks by carefully engineering the design and placement of the skylight with input from custom home builders in Calgary. Fine Line Homes is a leading Calgary custom home builder. Our extensive team of architectural and engineering professionals are well-versed in modern-day best practices for reducing energy consumption and promoting whole-house efficiency. We’re happy to advise clients on the benefits and drawbacks of any skylight design under consideration. To learn more about our proven process, please register with Fine Line Homes to receive your free, no-obligation information package.